This bleak moorland village of dark sandstone houses has changed very little since the day when the Reverend Patrick Bronte brought his wife and six children to live there in 1820. 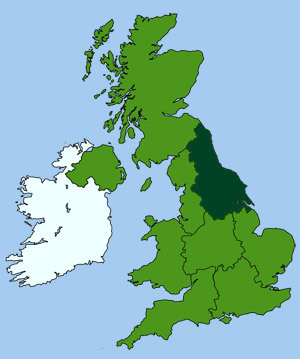 Today the town is visited by almost every visitor to the West Riding of Yorkshire. The main attraction being the early Georgian sandstone Parsonage, which was acquired at the end of the last century by the Bronte Society and is now a museum containing a wealth of objects associated with the Brontes, who lived there. The village still remains much as it did in the early 19th-c. The "Black Bull Inn", where the ill-starred Branwell was often to be found, is still standing near the church, at the top of Haworth's steep cobbled main thoroughfare. The Main Street now contains a mixture of tea rooms and gift shops. Only the tower remains of the original church, as fire destroyed the main building in 1879 and was rebuilt two years later. A brass plate marks the position of the family vault and a marble tablet commemorates this remarkable family. Central Park, located at the bottom of the Main Street in the valley, is a very pleasant place to relax after you have visited the church and museum and trawled through all the gift shops. At the far side of the park, just over the river, you can catch a steam or vintage diesel train from Haworth Station to Keighley or take the vintage open-top bus tour across the moors to Oxenhope. 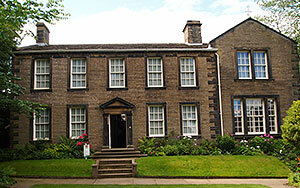 The Parsonage is furnished much as it was during	the Brontes' time and contains many family mementoes and personal memorabilia of the Bronte family. It was here that three of the Bronte girls, inspired by the austere and beautiful countryside, wrote some of our best-loved English novels. Emily Bronte, the most celebrated of the Bronte sisters, only wrote one novel, "Wuthering Heights", but it has won a secure place in English literature. Top Withens, a ruined farmhouse high on the moors about 3 miles west of Haworth, is generally believed to be the scene of Wuthering Heights. Its bleak location, some 1400 feet above sea-level, is indeed one of great solitude. Charlotte Bronte takes her place in literature chiefly for Jane Eyre, published anonymously in 1847, although she wrote three other novels and survived her sisters by many years. Anne Bronte's two novels are less celebrated. Visitors can still the tiny nursery where the girl's childish scribbles are still on the walls. Other rooms contain period furnishings, personal artifacts and pictures, including a portrait of the sisters by Branwell, Emily's writing desk and Anne's books and drawings. Facilities: Parking (nearby charged), shop. Restored 1950s heritage railway, which runs regular vintage diesel and steam trains between Keighley and the town of Oxenhope. 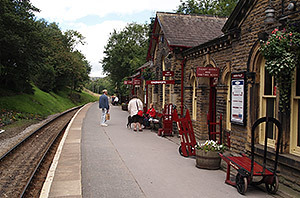 The line, which passes through the heart of Bronte country, was initially built to serve the mills of the Worth Valley. At Haworth there are locomotive workshops and there is an award-winning railway museum at Ingrow West. Special events run throughout the year. The line has been used as a film setting for several classics, including 'The Railway Children' and 'Yanks'. Facilities: Parking, cafe, picnic area, toilets.